In preparation of the Cavaliers season opener as Fire takes on last year's finalists United at Douglas Park on Saturday at 9AM, we decided to look at the some famous Cavaliers games from the years gone by. Cavaliers were re-formed in its new Avatar in 2010 after a hiatus. Cricket was not yet serious business in Saskatchewan. Teams played mostly for fun. Administrators and players got along. There was no code of conduct, no committees, and only a handful of Umpires! Cavaliers were in essence a bunch of guys getting together for the love of the game, enjoying a beverage and analyzing the losses. We didn't win much before 2012, so every win was celebrated like a new year!! Cavaliers T20 Record: Played 5 Won 2, Rank 5th. Cavaliers boasted one of the strongest but most inconsistent seam bowling attacks in those days with the pace of Jermain, Khurum, TJ, Farhan, Viru and Prakhar. Cavaliers also boasted probably the most brittle batting order in the league, and long collapses were the norm. Warriors were consistently the team to beat winning the Championship years in a row. They won the One Day and T20 Championship that year. This was Cavaliers last game of the season and they had one only a single One Day win upto that point. Warriors won the toss and decided to bat first. 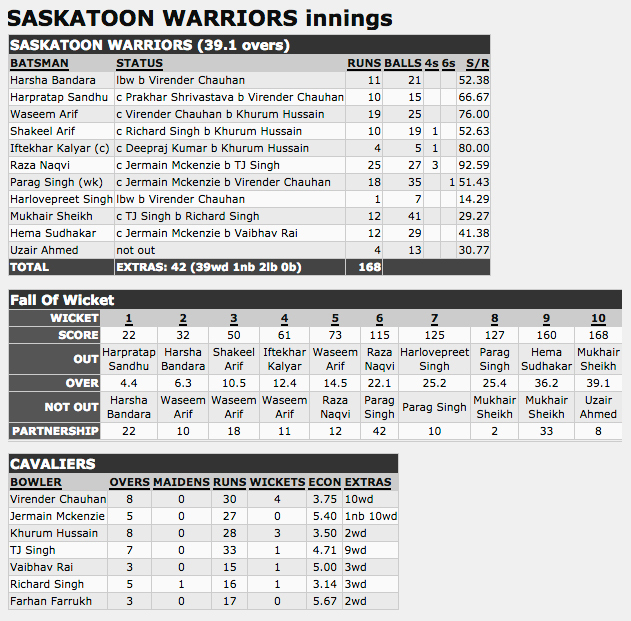 Warriors was jolted early as Viru dismissed both Warriors openers cheaply including Cavalier's chief tormentor - Harry Sandhu who loved making big runs against Cavaliers. Khurum then got into the mix dismantling the heart of the Warriors middle order with a spell of sheer pace leaving them reeling at 73/5 in 15 overs. 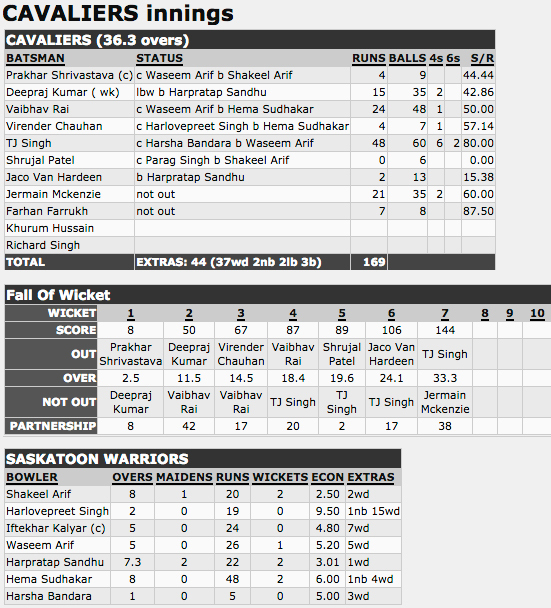 Some undisciplined bowling in the second half, allowed Warriors to reach a competitive 168 in 40 overs. Viru finished with 4 wickets and Khurum snapped 3. TJ and Richard grabbed a wicket apiece. Raza Naqvi top scored for Warriors with an aggressive 25. A score in excess of 150 was always going to challenge the brittle Cavaliers batting order. 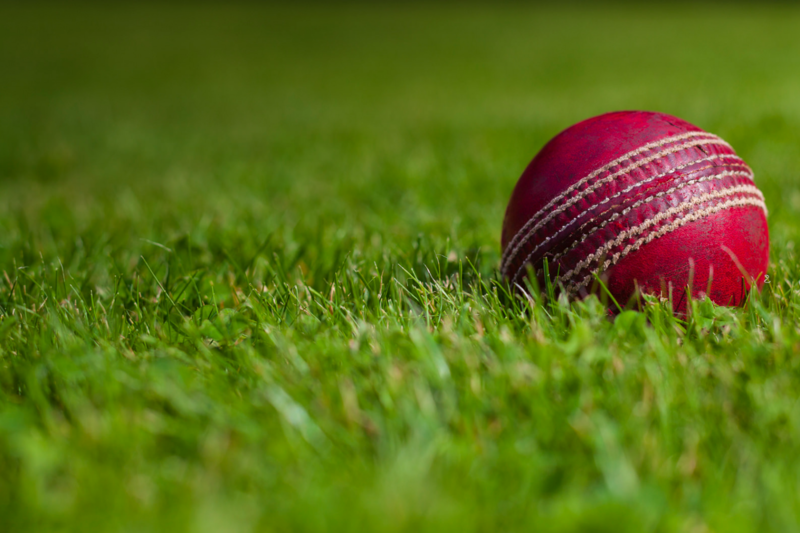 The chase started poorly for Cavaliers as they lost their first wicket early, but Deepraj and Rai batted sensibly to anchor the chase before Deepraj lost his wicket to Harry's off spin. A mid innings wobble duly followed with Cavaliers precariously poised at 106/6. Needing another 61 runs to win in 15 overs, TJ Singh took center stage playing his now trademark cover drives and midwicket pulls and in the company of Jermain got Cavaliers to within 24 runs of the win before he was dismissed caught at the boundary for 48. It felt like another lost opportunity but Jermain compiled a smart 21 and got Cavaliers over the finishing line with a 3 overs to spare - ending 2012 on a high.